A splendid green to garnish sandwiches and salads. Sowing instructions: Plant seeds 1 cm(0.5 in.) deep indoors from January-April or outdoors from May-September. 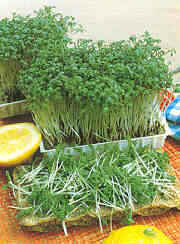 Plants can be harvested 15-20 days after sowing and reach a height of 10-14 inches.